Kari Copeland (left) of Coldwater, Miss., Margo Montgomery of New Orleans and Jeffrey Veals of Gloster, Miss., graduated recently with doctoral degrees in chemistry from the University of Mississippi. Editor’s note: The information in this release concerning numbers of graduates has been checked against a National Science Foundation report on “Doctorate Recipients from U.S. Universities.” In 2008, African-American students earned 50 doctorates in chemistry, and in 2010, the number was 54. Newswise — OXFORD, Miss. – Less than a year after launching an aggressive initiative to increase the number of graduates in science, technology, engineering and mathematics fields, the University of Mississippi has recorded an impressive national achievement by graduating three African-American students with doctorates in chemistry, an exceptional number for any university. “On average, about 50 African-American students receive Ph.D.s in chemistry nationwide each year, so UM produced 6 percent of the national total,” said Maurice Eftink, associate provost and professor of chemistry and biochemistry. The history-making candidates who received their degrees Friday were Kari Copeland of Coldwater, Margo Montgomery of New Orleans and Jeffrey Veals of Gloster. And a fourth African-American student, Shanna Stoddard of Louisville, Ky., is on track to earn her doctorate in chemistry in December. It is the second time in recent years that UM has set a benchmark in STEM fields. 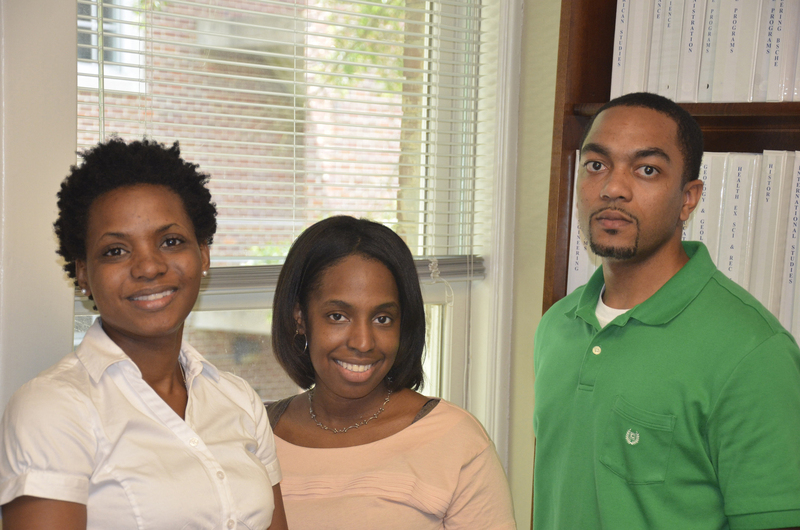 The university produced four African-American Ph.D.s in mathematics in 2006. “That was an even more outstanding achievement given that there are only 15-to-30 African-American Ph.D.s in math granted each year. But the current achievement is still pretty noteworthy,” Eftink said. Charles Hussey, UM chair of chemistry and biochemistry, lauded his faculty for their support. Besides the three African-Americans, four more UM students were awarded doctoral degrees in chemistry and biochemistry this commencement: Rajesh Kota of India, Debra Jo Scardino of Moss Point, Lei Wang of China and Ashley Wright of Texarkana, Texas. Overall enrollment of minority graduate students in chemistry and biochemistry at UM has been noteworthy over the years. In addition to the three students who graduated, four more minority students have passed their prospectus and are moving on to begin Ph.D. work. “Hopefully, these graduates will view their UM experiences as positive and will spread the word, so that others may become interested in taking advantage of similar opportunities,” Hussey said. The newest alums have already begun cheering for their alma mater. Faculty advisers said each student was exceptional in his or her respective field of study. Copeland completed both her bachelor’s and master’s degrees in biochemistry from UM. Her immediate plans are to continue research at Jackson State University as a post-doctoral researcher. Walter Cleland, assistant chair and associate professor of chemistry and biochemistry, and Montgomery’s adviser, said she proved herself during four years of teaching at UM and already has tenure track offers from several colleges, including one in Mississippi. Veals, whose field is computational chemistry, used computational methods to explore the possibilities of storing and releasing energy using strained molecular structures. Copeland is a Southern Regional Education Board Scholar. One of the organization’s initiatives is to increase faculty diversity in America’s colleges and universities. “In light of this, I plan to eventually seek a faculty position,” Copeland said. Montgomery holds a bachelor’s degree in chemistry from Xavier University of Louisiana. Her dissertation was on “Synthesis and Characterization of Nickel Complexes with Relevance to Acireductone Dioxygenase.” She hopes to develop a summer science academy where students from all walks of life are exposed to the sciences in a nontraditional manner. Veals, who earned both his bachelor’s and master’s degrees from UM, is to be a post-doctoral researcher at the University of Missouri. His long-term goal is to become a chemistry professor.